Experience the cultural wealth, ancient caravan cities, hospitable people and striking natural scenery of Uzbekistan, Central Asia’s most fascinating country. Late evening arrival in Tashkent. Our city tour takes us to the architectural complex of Khazrati Imam (Hast Imam) which is a religious center of Tashkent. Hast Imam complex is located in the old part of Tashkent city. We will visit old Uzbek living quarter where you will be acquainted with the style of life of Uzbek people who lived there for centuries. One of the specially built constructions houses the 8th century Uthman Qoran which was brought in Samarkand by Temur the Great in the 14th century from one his military campaigns to Middle East. It is a religious center of Tashkent. Hast Imom complex is located in the old part of Tashkent city. 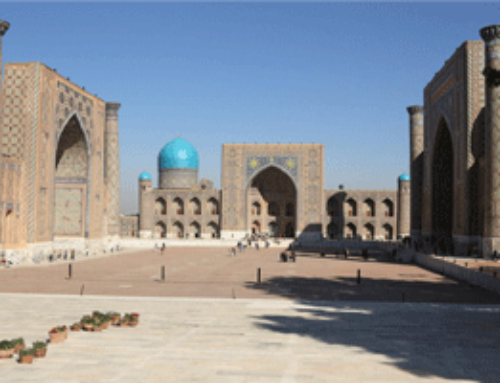 It houses the 8th century Uthman Qoran which was brought in Samarkand by Temur the Great. Since 1941 it had been permanently held in the Museum of History of the Peoples of Uzbekistan in this complex. After that we will pay a visit to the Museum of Applied Art situated in a splendid house commissioned by a wealthy Tsarist diplomat wonderfully decorated by the country’s finest artisans. Continuing our introduction to Uzbekistan, At the Abdul Khasim Medrassah we will visit artisans making traditional Uzbek crafts in former student cells, including metal chasers, woodcarvers, miniature-painters, jewelers, mosaic artists, embroiderers, etc. On the edge of the section of Tashkent that survived the earthquake we will visit the large and exciting Chorsu Bazaar. People from all over, some in traditional dress, are drawn to this huge bazaar to find things unavailable elsewhere in the country. Here we will see typical Uzbek cradles specially outfitted for swaddled infants, hand-made musical instruments, hope chests, carpets, tea sets and a variety of other needs. We will also visit the large fruit and vegetable market with its splendid displays of neatly stacked, colorful fruits and vegetables, bags of spices, bowls of nuts and raisins, varieties of milk products and hanging carcases. After our visit to the market we will drive to the workshop of Akbar Rakhimov, a local potter and one of the most noted ceramic artists in the country. We will be able to see the colorful traditional ceramics in his museum. After breakfast flight to Fergana. Right after checking in we’ll take a short walking tour of this greenest city of Uzbekistan and have lunch at a local restaurant. We’ll devote the rest of the day to visiting Margilan, well-known for its Fergana style architecture and silk factories as it rightfully considered the center of silk production of the whole Central Asia. So we’ll have a chance to see the age-old process of silk production and learn more from the masters about the distinctive colors and patterns historically coveted by Chinese and Persian merchants. Drive back to Fergana. Traditional dinner. Morning depart by road to Kokand, capital of the Kokand Khanate in the 18th and 19th centuries. 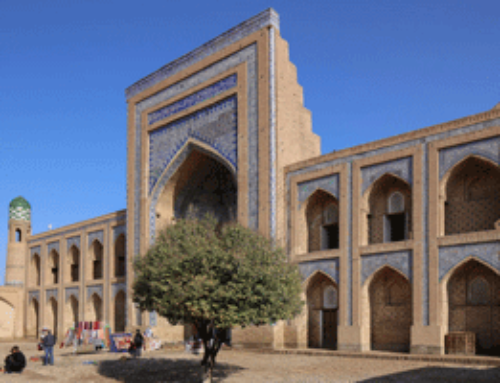 Visit the Khan’s palace museum, mosques and madrasahs. Continue to Rishtan, one of the most important ceramic centers in Central Asia. We’ll visit the private studio of a master ceramic artist and learn about the traditional floral designs native to the region. Lunch at the potter’s home. Dinner at a nice local restaurant. After breakfast flight back to Tashkent and continue by road on to legendary Samarkand, the grand capital of the emperor Tamerlane. The road goes through Tashkent, Syrdarya regions and mountainous countryside of Jizzakh region of Uzbekistan where you may want to make spontaneous stop for photographing. After arriving and checking in the hotel lunch at a nice local restaurant. After lunch we’ll visit exhibition of folk arts at Samarkand State Art Museum. Then continue sightseeing Registan Square with its majestic madrasahs and numerous shops. Full day excursion to Shakhrisabz, the actual birth place of Tamerlane. Visit to Ak Saray (White Palace), Tamerlane’s vast residence complex built in the 14th and 15th centuries. Visit the Jahongir mausoleum, continue to the Kok-Gumbaz mosque, Dorus Tilavet and Shamseddin Kulyal Mausoleums. Lunch in Shakhrisabz. After lunch visit the craft centers of the region. You will get acquainted with the ancient techniques of silk embroidering. After breakfast depart Samarkand as we continue tracing the Silk Route to holy Bukhara by the Royal Road (one of the most important of the Silk Route connecting Samarkand and Bukhara) making a stop in Gijduvan to visit the most important ceramic center of Bukhara region. If we’re lucky we’ll have the opportunity to see centuries old tradition of using a donkey for spinning the millstones during the process of natural dyes grinding. Lunch at the local potter’s home. Continue afternoon drive on to Bukhara and visit Suzani artist in her home on our way to see how suzanis are made by hand. Arriving in Bukhara early evening. Dinner at the hotel. After breakfast we’ll start full day walking tour of Bukhara to include a visit to the 2000 year-old Fortress Ark where Emirs once lived. Visit Poi-Kalon, or “Pedestal of the Great”, the heart and focal point of all Bukhara then continue to the Ismail Samani Mausoleum, dating from the early 10th century and to Chashma Ayub – the Spring of Job, where according to the old Testament, Job caused water to gush from the desert. After lunch in a local teahouse or restaurant, continue sightseeing to Magoki – Attori mosque, dating from 12th century, Medressahs of Ulug-Bek and Abdul-Aziz Khan, Visit Magoki – Attori mosque, dating from 12th century, Medrasahs of Ulug Bek and Abdul-Asis Khan. You will also see Lyabi-Khaus otherwise known as The Shore of the Pool, an architectural complex consisting of the 16th century medrassah and a mosque and the nearby dome covered markets. In the evening dinner and folk program in an old Medrassah. 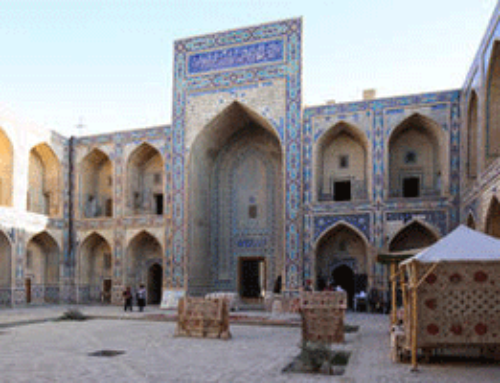 After breakfast you’re invited to visit the most important craft places of Bukhara. We’ll start at the Silk Factory, then continue to the Bukhara Gold Embroidery Factory, after that go to the Museum of Blacksmith’s Art and to complete the morning session stop at the Craft Center situated in an old caravan-saray, where we’ll have an opportunity to see demonstration of many Uzbek crafts. After lunch in the courtyard of the Craft Center we’ll drive to the Sitorai Mohi Hosa (5 km north of the city). The former summer residence of the last ruler, it has beautiful stucco plaster interior decorations, huge banquet halls, and a large collection of costumes, silver and Ming china. You will see Bukharan textiles exhibition situated in the building of the former Harem of the last emir. In the evening dinner at a local restaurant. After breakfast we’ll continue our drive to Khiva, the last great oasis on the old caravan route that will lead us through the Kizil Kum (Red Sands) desert to this remote desert city. We will have a lunch stop on the road. Continue drive to Khiva and arrive late afternoon. The rest of the day we’ll do some walking sightseeing of old Khiva. 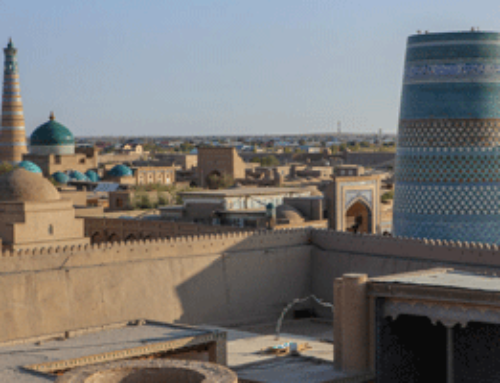 After breakfast you’re welcome to continue sightseeing of Khiva, the most intact and remote city of Central Asia. Experience the richness of this museum city that houses the most homogenous collection of architecture in the Islamic world. Lunch at a local reataurant. In the evening dinner with folk music and dance. After breakfast drive to Urgench (capital of Khoresm region) to depart for Tashkent by air. Upon arrival in Tashkent we’ll visit the exciting Chor-Su market to see cradles, hand-made musical instruments, and fruit and vegetable market. To conclude the journey, we’ll have a final feast of Uzbek national dishes and farewell toasts.